As the weather cools in down in the Phoenix Valley the golfing heats up. Unfortunately, so do the prices at most valley golf courses. For Arizona residents that want to continuing playing during the fall and winter purchasing a Discount Golf Card is a great option. Our Grand Slam Club Card provide card holders with discounted green fees and priority tee-times. 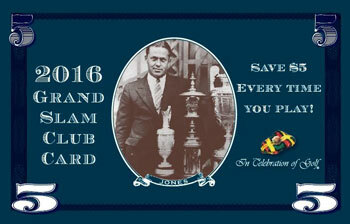 As an In Celebration of Golf managed golf course we offer our Grand Slam Club Card. The Grand Slam Club Card is just $79 and saves you $5 off your tee-time each time you play our course. Book an available tee time online or through the golf shop anytime up to seven days in advance. Receive $5 off your booked rate when you check in at pro-shop counter. The golf course and driving range will be closed starting June 1st for turf maintenance, and will remain closed through over-seed. All 18 holes will re-open for the season on Friday, October 5th 2018. The hotel, restaurant, fields, academy, Performance Center and meeting spaces will be open as usual. Copyright © 2019 Francisco Grande Hotel and Golf Resort All Rights Reserved.